Today I would like to highlight one of my new favorite podcasts: Harry Potter and the Sacred Text. I first learned about this podcast when two its creators spoke at the Yule Ball (a wizard-rock concert put on by Harry and the Potters–yes, it was amazing). As soon as I realized what the premise of this podcast was I knew that I would have to check it out. Each week hosts Vanessa Zoltan and Casper ter Kuile discuss a chapter of Harry Potter (starting from the beginning of the first book and working chronologically from there) as though it were a sacred text. Trusting the text: We practice the belief that the text is not “just entertainment”, but if taken seriously, can give us generous rewards. Trusting the text doesn’t mean we understand the text to be perfect – either in construction on moral teaching – but that it is worthy of our attention and contemplation. A guiding principle is that the more time we give to the text the more blessings it has to give us. Rigor and ritual: By reading the text slowly, repeatedly and with concentrated attention, our effort becomes a key part of what makes the book sacred. The text in and of itself is not sacred, but is made so through our rigorous engagement. Particularly by rigorously engaging in ritual reading, we believe we can glean wisdom from its pages. Reading it in community: Scholars of religion explain that what makes a text sacred is not the text itself, but the community of readers that proclaim it as such. The same applies for us. We started reading Harry Potter in community in Cambridge, Massachusetts in September 2015 and are excited to be expanding that community through this podcast! For more information about the format of the podcast itself, visit their website at harrypotterandthesacredtext.com. As someone who has never been very religious, I greatly appreciate the philosophy behind this podcast. I have always felt a greater, deeper, more meaningful connection to books than I have to any form of religion, and this podcast has helped me to realize and articulate that connection much more effectively. So many of the same values that are sought after with religion–a deeper understanding of the self and one’s place in the world, words of wisdom, life lessons, etc.–can be found in literature as well. The fantastic thing about this podcast is that it also provides readers with something not often associated with books: a community. Something I love about this podcast is the constant flow of ideas between Vanessa, Casper, and the listeners who send in voice messages with their own thoughts from week to week. Not only does this make for more interesting discussions, but it also creates a sort of safe space in which ideas don’t have to be fully fleshed out or agreed with–they can simply be voiced as a new perspective, as another way to think about the text. Casper and Vanessa are not afraid to disagree with each or poke holes in each other’s arguments, but it’s never in a way that is demeaning of harsh; rather, these disagreements actually deepen the discussion, challenging both of them to think in more nuanced ways. This openness is the sort of environment that creativity and thought flourishes in, and I think it’s so wonderful that this podcast has created such a great platform for this kind of discussion. Perhaps my favorite thing about this podcast is how it almost feels like a form of rereading Harry Potter without actually opening up the books. While they do encourage you to read the chapters along with them each week so the details are fresh in your mind, I kind of like having my memory jogged by their discussions. It’s like experiencing the series all over again through someone else’s eyes, which is something we rarely get to do with such beloved stories as Harry Potter. When I eventually do reread the series myself, I can only imagine the new details and connections that this podcast will allow me to see in the pages. 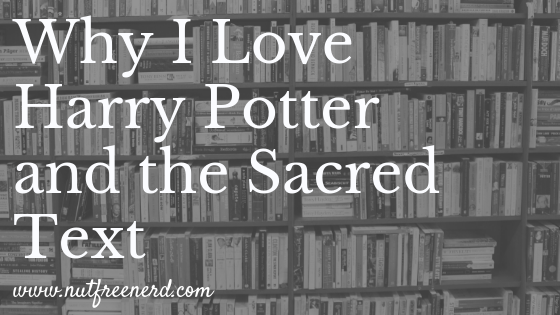 If you’ve never listened to Harry Potter and the Sacred Text, I highly, highly recommend that you do! If you have, let me know what you think of it in the comments section below!